There was a time in India when going to the bank meant spending at least half a day in a long queue, waiting endlessly for a user’s financial details to be updated in paper passbooks and ledgers. The bank of today is completely different – its digitized, fast and also, smart. Smart is a simpler way of denoting the extremely intuitive and efficient manner in which banks are processing huge amounts of user data. Banks are now providing chatbots, personalized services, preventive maintenance, fraud detection and more, to enhance customer experience and improve operational efficiency. 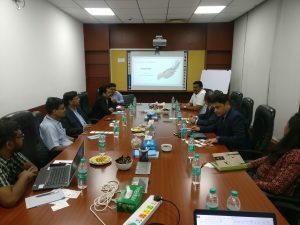 Participants of the BFSI Strategic Innovation Group at NASSCOM CoE DSAI Bangalore. Suresh Iyer, Executive Director, Head of Enterprise Data Management, Nomura Services India Pvt. Ltd.